The odontoid process, also called the dens, is a protuberance of the axis. Life-threatening fractures can occur as a result of forces acting on this anatomical structure due to its proximity to the spinal cord and brainstem. 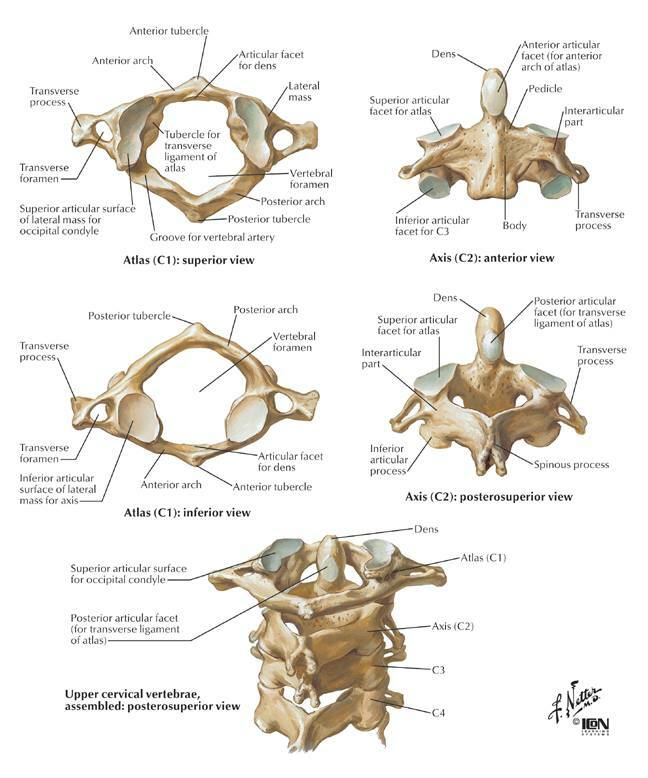 The C2 vertebra, also known as the axis, is one of three atypical vertebrae. The axis shows a peg-like odontoid process that projects itself superiorly from the body. The odontoid process lies anterior to the spinal cord and is used as the pivot for the rotation of the head. The C1 vertebra, carrying the cranium, rotates on this. 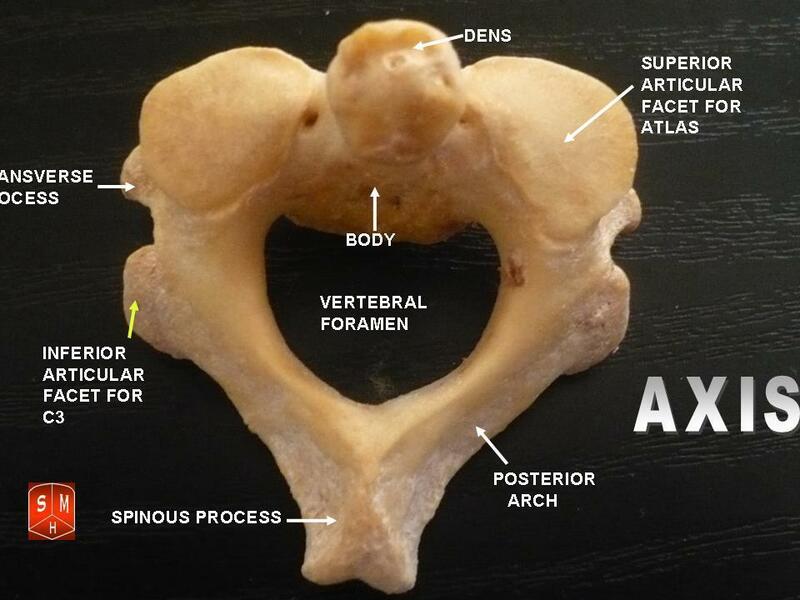 The craniovertebral joint between the atlas and the axis is called, the atlanto-axial joint. The craniovertebral joints distinguish themselves of the others vertebral joints because they do not have intervertebral discs; therefore they possess a wider range of motion than the rest of the vertebral column. The odontoid process and anterior arch of the atlas are held together by the transverse ligament of the atlas. This ligament prevents anterior displacement of C1 and posterior displacement of C2. If any displacement of this form would occur the spinal cord can be compromised due to the narrowing of the vertebral foramen. Structures that cannot be forgotten are the cervical nerves who pass above and underneath the axis; these nerves are crucial for both the head as the respiratory system (diaphragm). Fractures of the dens represent almost 15% of all cervical spine injuries and represent the most common axial fracture type. The demographic group varies as these fractures occur in both in young patients due to a high-energy trauma (e.g. a motor vehicle accident) and in elderly patients due to a low-energy trauma (e.g. a fall). The underlying mechanism of injury is hyperextension of the neck. Other possible mechanisms include blunt trauma or hyperflexion trauma. Type I: avulsion fracture of the apex. Stable injuries. Type II: fracture through the base of the dens, at the junction of the odontoid base and the body of C2. Often unstable injuries. 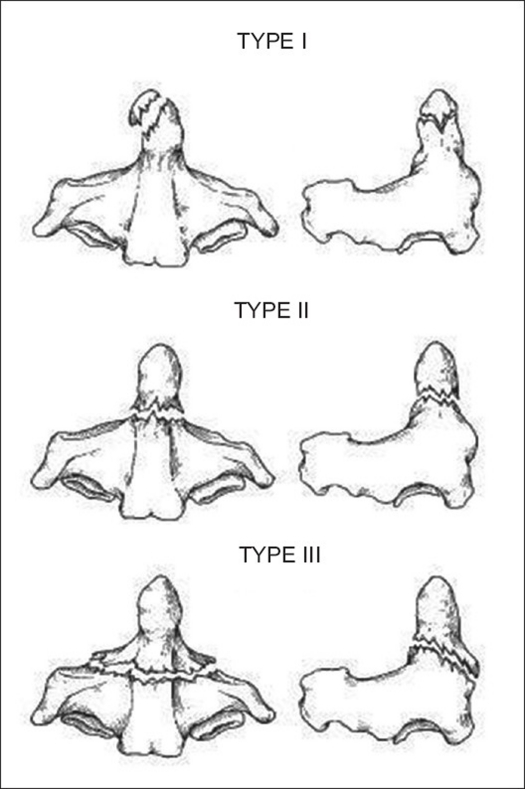 Type III: fracture extends into the body of the axis. Usually stable injuries. There is a subdivision of type 2 fractures. A type 2A fracture is minimally displaced and is treated with external immobilisation. A type 2B is displaced and is generally treated with anterior screw fixation. A type 2C is a fracture that extends from antero-inferior to postero-superior and is treated with instrumental fusion of C1 – C2. It is very important to asses any co-morbidities in the diagnostic process because they can affect the treatment. Beside the assessment of the co-morbidities it is very important to subject the patient to a full neurological examination. In the literature, mainly 4 treatment strategies are reported, each with distinct pros and contras. Surgically, the two discussed treatments are anterior screw fixation and posterior C1-C2 fusion. Conservatively, the two most reported treatment options are the Halo vest and the rigid cervical collar. The treatment of Type I and Type III odontoid fractures has shown to be effective on a conservative manner. The positive outcome of conservative treatment in terms of higher union rate is related to the higher stability of the Type I and III fractures in comparison to Type II fractures. Considering which treatment option to go for, co-morbidities should be assessed first, so that insight could be obtained in possible complications. A neurological assessment should also be performed to identify eventual spinal cord injury. Although secondary myelopathy as a result of non-union related instability forms a higher risk in elderly, this is a rare complication of non-union which could even take years after follow-up before becoming symptomatic. There have also been a few case reports about Type III odontoid fractures causing onset of Brown-Séquard syndrome, but this is very rare. Surgical indications reported in literature are poly-trauma, neurological deficit, symptomatic non-union (myelopathy) and unstable non-union. Patients presenting aforementioned risk factors for non-union are also considered as being indicative for surgery. Anterior odontoid screw fixation: one or 2 screws are inserted via the anterior-inferior corner of the C2-endplate to stabilise the fracture. Reports say that the Type IIB fracture (anterior-superior to posterior-inferior) have the most ideal geometry for this technique. Posterior C1-C2 fusion: different techniques are reported. Gallie wiring technique, Magerl C1-C2 transarticular screw fixation and Harms posterior C1 lateral mass and C2 pars screws. Morbid obesity and thoracic kyphosis can interfere with a correct achievement of screw trajectory. According to an 11 year-retrospective study, non-operative management of stable Type II fractures has shown to have positive long-term functional outcomes in a younger population. Elderly (>65years) showed poor long-term functional outcomes with higher rates of non-union. There’s a big challenge in the fact that non-operative management with external immobilization correlates with high rates of morbidity (complications) and mortality in elderly, especially with the Halo vest.. However, in some retrospective studies, the authors claim not to know the exact causes of death, which could be just age-related. Halo vest immobilisation has furthermore been reported to have a non-union rate ranging from 26% to 80%. The use of a semi-rigid cervical collar is said to be the treatment of choice in elderly (and younger patients with stable fractures), considering the problems related to Halo vest immobilization and the surgical risks of operative treatment. Non-union rates vary up until 77% for cervical collar immobilisation, but when achieving an asymptomatic stable fibrous union is considered a favourable outcome, the union rates raise up to 92%. Considering the complexity of the treatment of Type II odontoid fractures in elderly and poor total union rates, lowering the outcome expectancy from total union to asymptomatic fibrous union could be taken into consideration. The evidence doesn’t provide any consensus on the treatment strategy for (Type II) odontoid fractures, making an individual approach necessary. Physiotherapy management of these conditions is reserved for post- medical management rehabilitation.